Purchase Zenphorol right now online with confidence via our secure store. Fast delivery worldwide. 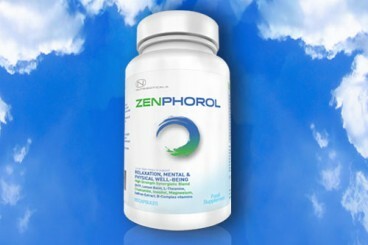 Zenphorol is a natural alternative to anti-depressants and anti-anxiety drugs. It’s effective at stress and anxiety relief, reduces symptoms of depression and panic attacks, boost mood, aid restful sleep, relaxation, and physical and mental well-being. Daily stress and anxiety not only wreaks havoc with our sense of well-being, but also shortens our lives by contributing to heart disease, diabetes, and cognitive impairment.1-3 Drugs companies created medication to treat symptoms of anxiety and stress, but health conscious people avoid them for fear of addiction and side effects.4-5 Zenphorol provides natural and effective relief from stress, anxiety, depression, insomnia and sleep disorders by combining a powerful and synergistic blend of nature’s best ingredients. 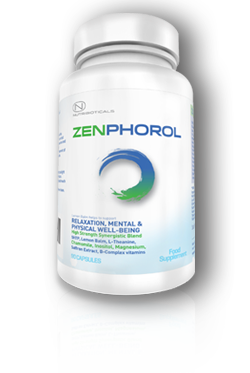 Zenphorol contains the highest quality 5HTP, Lemon Balm, L-Theanine, Chamomile, Inositol, Magnesium and B Complex vitamins, totalling a massive 1530mg active per serving. It comes from the seeds of an African plant called Griffonia Simplicifolia. It’s a precursor to serotonin which regulates mood and behaviour. 5HTP is not directly found in the foods we eat, which makes supplementation incredibly useful. Studies show 5HTP may be as effective as standard antidepressant drugs,6 which are also commonly used to help treat anxiety and insomnia. The 5HTP in Zenphorol is 100% pure Griffonia Simplicifolia. A deficiency in B1 can be common and facilitate drastic swings between lethargy and hyper-excitability. It is important for blood sugar control and this has a major impact on anxiety. B vitamins are essential for stress management, energy production, and neurotransmitter health. Magnesium Citrate, Capsule Shell: Hydroxy Propyl Methyl Cellulose, Lemon Balm, Griffonia Seed Extract, Chamomile Flower Powder, L-Theanine, Inositol, Niacin, Pantothenic Acid, Vitamin B6 (Pyridoxine Hydrocloride), Riboflavin, Thiamine (Hydrochloride), Folic Acid, Biotin, Vitamin B12 (Cyanocobalamin), Saffron Extract. I already take 5HTP regularly and am aware of the benefits of Magnesium and Chamomile, so this product looked very interesting. What I also noticed with this product was the rather large quantities of each ingredient, which as anyone who takes supplements regularly knows that's what is needed to have any real effect. I didn't know too much about Lemon Balm but looked it up and there literally loads of scientific studies proving it's effectiveness. Magnesium and Inositol are solid ingredients too. The price seems good value for all these combined so I took a chance. I took 1 pill 3 times a day on the first day and felt mildly relaxed, nothing major. The second day I took 3 together 1 hour before bed time and WOW I slept better than I have for years and woke with no grogginess, feeling great. For the past 3 weeks I have been back to taking 1 capsule 3 times a day and I have truly never felt better. I was paying £20 a month previously just for 5HTP, now I will never go back to taking it alone. It is FAR more effective this way. If like me you have suffered with anxiety, depression and insomnia for a very long time, then I really do recommend you try Zenphorol. Purchase Zenphorol right now online with confidence via our secure store. A. Yes! Ingredients in Zenphorol were specifically selected that are powerful, work synergistically and are backed by science, with a full list of references. Q. Is Zenphorol right for me? A. If you suffer from anxiety, panic attacks, insomnia or broken sleep patterns, Zenphorol is designed for you. Feel better and get your life back on track. The formula is powerful yet gentle enough so you can enjoy life to the full. Q. What is the dosage and serving size of Zenphorol? A. Zenphorol comes as 90 capsules, with 3 capsules a day dosage. You can consume 1 capsule 3 times a day for anxiety relief. Or take 3 capsules 1 hour before bedtime to aid restful sleep. You can use these different dosages on different days, but do not consume more than 3 capsules per day. Each serving is 1530mg. Q. Is Zenphorol the best natural anti-anxiety treatment? A. We believe at a massive 1530mg per serving that Zenphorol is the best product of this kind on the market. Q. Will it make me drowsy during the daytime? A. Follow the directions of 1 capsule 3 times a day (usually spaced 3-5 hours apart) and there should not be any drowsiness. If you feel any drowsiness after 1 capsule, discontinue use and contact us. Consuming 3 capsules 30-60 minutes before bedtime may facilitate light drowsiness and help fall into a deep restful sleep. Do not consume more than 3 capsules in 24 hours. Q. Can I take Zenphorol with other medication or drugs? A. It may be possible to take Zenphorol together with some medication. However, you need to clear this with your physician. Seek medical advice before combining any medication. Q. How safe is Zenphorol? A. Zenphorol is manufactured in state of the art facilities under GMP (Good Manufacturing Practice) license and is legal for sale throughout the world (UK/EU/USA and all participating GMP countries). There are no toxic ingredients contained. It is 100% safe. If you have any allergies, please consult your physician before use. Q. Can I interrupt taking Zenphorol? A. Yes. It is a food supplement, not a medicine. You can take Zenphorol on whatever days you feel you need to. For optimum effect, take 3 capsules daily, on-going. 1. Sridhar GR. Psychiatric co-morbidity & diabetes. Indian J Med Res. 2007 Mar;125(3):311-20. 2. Csaba BM. Anxiety as an independent cardiovascular risk. Neuropsychopharmacol Hung. 2006 Mar;8(1):5-11. 4. Beracochea D. Anterograde and retrograde effects of benzodiazepines on memory. ScientificWorldJournal. 2006;6:1460-5. 5. Savic MM, Obradovic DI, Ugresic ND, Bokonjic DR. Memory effects of benzodiazepines: memory stages and types versus binding-site subtypes. Neural Plast. 2005;12(4):289-98. 6. * Byerley WF, Judd LL, Reimherr FW, et al. 5-hydroxytryptophan: a review of its antidepressant efficacy and adverse effects. J Clin Psychopharmacol. 1987;7:127-137. 7. Gyllenhaal C, Merritt SL, Peterson SD, Block KI, Gochenour T. Efficacy and safety of herbal stimulants and sedatives in sleep disorders. Sleep Med Rev. 2000 Jun;4(3):229-51. 8. Kennedy DO, Little W, Haskell CF, Scholey AB. Anxiolytic effects of a combination of Melissa officinalis and Valeriana officinalis during laboratory induced stress. Phytother Res. 2006 Feb;20(2):96-102. 9. Dimpfel W, Pischel I, Lehnfeld R. Effects of lozenge containing lavender oil, extracts from hops, lemon balm and oat on electrical brain activity of volunteers. Eur J Med Res. 2004 Sep 29;9(9):423-31. 10. Kennedy DO, Little W, Scholey AB. Attenuation of laboratory-induced stress in humans after acute administration of Melissa officinalis (Lemon Balm). Psychosom Med. 2004 Jul;66(4):607-13. 11. 12. Available at: http://www.nutraingredients.com/news/ng.asp?id=75166-berkem-lemon-balm-extract-stress-anxiety. Accessed May 22, 2007. 14. Park SK. Jung IC. Lee WK. Lee YS. Park HK. Go HJ. Kim K. Lim NK. Hong JT. Ly SY. Rho SS (2011) “A combination of green tea extract and l-theanine improves memory and attention in subjects with mild cognitive impairment: a double-blind placebo-controlled study” Journal of Medicinal Food 14 (4): 334–343. doi:10.1089/jmf.2009.1374. PMID 21303262. 15. Cooper R, Morre DJ, Morre DM. Medicinal benefits of green tea: Part I. Review of noncancer health benefits. J Altern Complement Med. 2005 Jun;11(3):521-8. 16. Egashira N, Hayakawa K, Mishima K, et al. Neuroprotective effect of gamma-glutamylethylamide (theanine) on cerebral infarction in mice. Neurosci Lett. 2004 Jun 3;363(1):58-61. 19. 68. Avallone R, Zanoli P, Corsi L, Cannazza G, Baraldi M. Benzodiazepine compounds and GABA in flower heads of matricaria chamomilla. Phytotherapy Res. 1996;10:177–179. 20. Saller R, Beschomer M, Hellenbrecht D. Dose dependency of symptomatic relief of complaints by chamomile steam inhalation in patients with common cold. Eur J Pharmacol. 1990;183:728–729. 21. Carnat A, Carnat AP, Fraisse D, Ricoux L, Lamaison JL. The aromatic and polyphenolic composition of Roman camomile tea. Fitoterapia. 2004;75:32–38. 22. Benjamin J1, Levine J, Fux M, Aviv A, Levy D, Belmaker RH. Double-blind, placebo-controlled, crossover trial of inositol treatment for panic disorder. Am J Psychiatry. 1995 Jul;152(7):1084-6. 23. Palatnik A1, Frolov K, Fux M, Benjamin J. Double-blind, controlled, crossover trial of inositol versus fluvoxamine for the treatment of panic disorder. J Clin Psychopharmacol. 2001 Jun;21(3):335-9. 24. Hanus M, Lafon J, Mathieu M. Double-blind, randomised, placebo-controlled study to evaluate the efficacy and safety of a fixed combination containing two plant extracts (Crataegus oxyacantha and Eschscholtzia californica) and magnesium in mild-to-moderate anxiety disorders. Curr Med Res Opin. 2004;20:63-71. 25 J Integr Med. 2013 Nov;11(6):377-83. doi: 10.3736/jintegrmed2013056. Saffron (Crocus sativus L.) and major depressive disorder: a meta-analysis of randomized clinical trials. Hausenblas HA1, Saha D, Dubyak PJ, Anton SD. 26 Phytother Res. 2005 Feb;19(2):148-51. Crocus sativus L. in the treatment of mild to moderate depression: a double-blind, randomized and placebo-controlled trial. Akhondzadeh S1, Tahmacebi-Pour N, Noorbala AA, Amini H, Fallah-Pour H, Jamshidi AH, Khani M.